The 101 will be widened between I-17 and Pima Road. 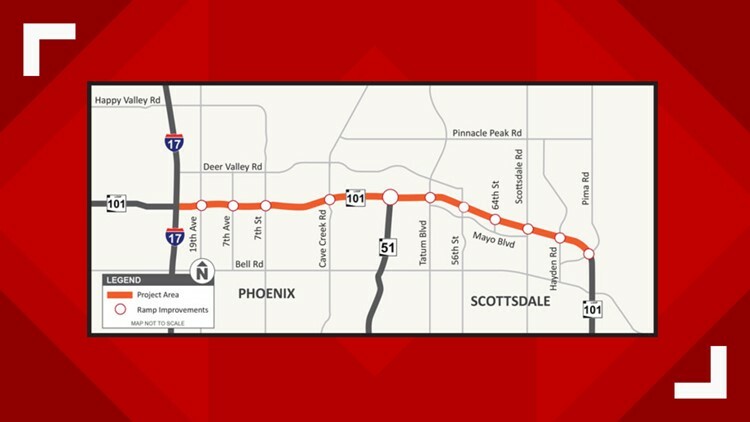 PHOENIX — Arizona Department of Transportation’s Loop 101 expansion is less than a month away. The upcoming construction will undoubtedly be cause for delays and potential changes to your daily commute. ADOT will soon launch its project of expansion between I-17 and Pima Road. Additional lanes will be added in each direction, along with an overpass on Miller Road. Modifications will also be made to ramps and frontage road connections. Traffic restrictions are anticipated for commuters, and it is recommended to look into the impact construction may have on your commute. Construction will affect those who travel between Phoenix and Scottsdale, planned completion is early 2021. ADOT plans to keep construction times to a minimum due to the utilization of the design-build method, which claims to carry out projects in a more timely manner. The $185 million expansion was approved by Maricopa County voters in 2004 and is funded by the Maricopa Associations of Governments Regional Transportation Plan. ADOT will be holding public meetings on January 16 and 17 prior to construction. Additional information can be found on ADOT’s website.